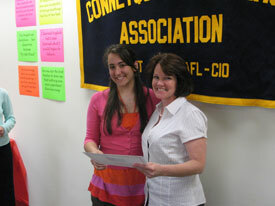 Establishing a new tradition, the Connetquot Teachers Association held its own awards ceremony to acknowledge six students who submitted winning essays. 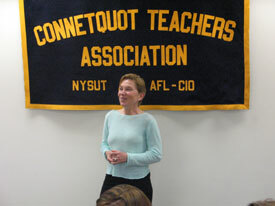 The CTA's Public Relations Committee organized the event, which took place on May 15, 2007. 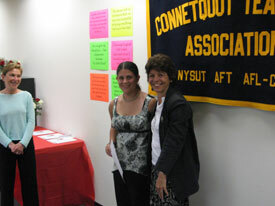 Six Connetquot students received college scholarships from the CTA after submitting winning essays entitled Teachers Who Made a Difference in My Life. The students and their parents and the teachers the students wrote about were in attendance. It was a very positive ceremony for all who attended. 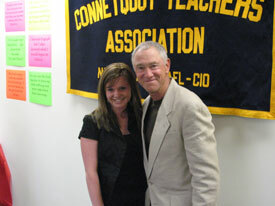 "It is great to see the impact that teachers can have on students. This was a very nice ceremony." said a parent of a winner. 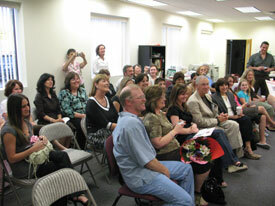 The ceremony was held at the CTA office. Below are the pictures from the ceremony. Ms. Nancy Dunlop, Public Relations Chairperson, congratulates the winning students, their parents and teachers. 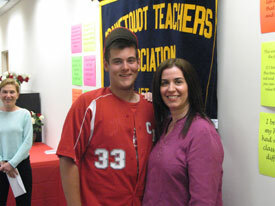 Mr. Joseph Licato was unable to attend the ceremony. 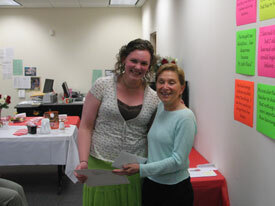 Shannon McNally is pictured here with Ms. Nancy Dunlop. Parents watch as their children receive the award. Teachers and students pose for a picture.